Leroy says Tesla doesn't have a sound business model. 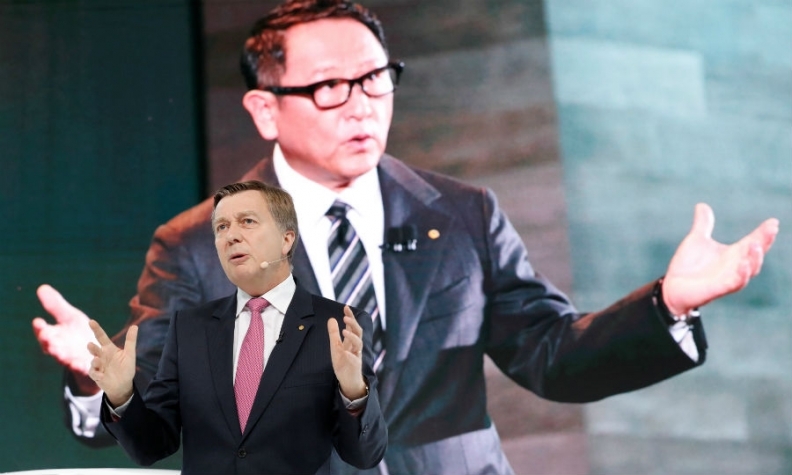 He is pictured on stage in Tokyo with CEO Akio Toyoda on the background screen. Toyota traditionally has been overly politically correct, never making a bold statement or saying something that could displease a competitor. Executive Vice President Didier Leroy showed the new face of a much more adventurous Toyota at the Tokyo auto show this week. Below are edited remarks the French executive, who is the right arm of Toyota CEO Akio Toyoda, made at a dinner on the sidelines of the show. Toyota could buy another one, two or three companies to be the world’s No.1 automaker again, but chasing volume for the sake of being No.1 is pointless. Toyota had consistently sold over 10 million units a year, so we have scale. And customers buy products and brands, not a position in the automaker ranking. When will Toyota launch its first full EV? It will come and you'll see it when it's ready. While other automakers circulate detailed PowerPoints of their far future product plans, we unveil a new product only when it's ready, so our customers can buy it and our dealers can sell it. At Toyota, we aim for profitable growth, so selling an EV and losing $10,000 per unit as Tesla does is not a sound business model in our view. Have a close look at EV sales in Europe: they are strong in Norway, significant in France – thanks to Renault-Nissan – and growing in Germany, but in the rest of Europe they are basically zero. Zero! At Toyota, we took some crucial decisions on diesels well ahead of the Volkswagen diesel scandal. We decided in 2014 not to offer a diesel on the CH-R (compact crossover). Here in Tokyo on December 1, 2011, I signed the contract to buy diesel engines from BMW for some of our European products because we had decided – almost six years ago – that investing in diesel engine development was no longr a priority at Toyota. By the way, at that time, 40 percent of our European sales were diesels, now they are 15 percent.